There's nothing wrong with that, though. When my mom asked if she should upgrade from her Galaxy S8 to an S9, I struggled to find an answer. After spending about ten days with Samsung's latest flagship, I'm still torn. Besides the fact that I'd rarely recommend people upgrade from a year-old phone in general, this generation of the S series also lacks any thrilling new features. I'm not going to fault Samsung for that, though. It's basically impossible to dream up revolutionary new technology every year. And sometimes it's the small improvements that count. 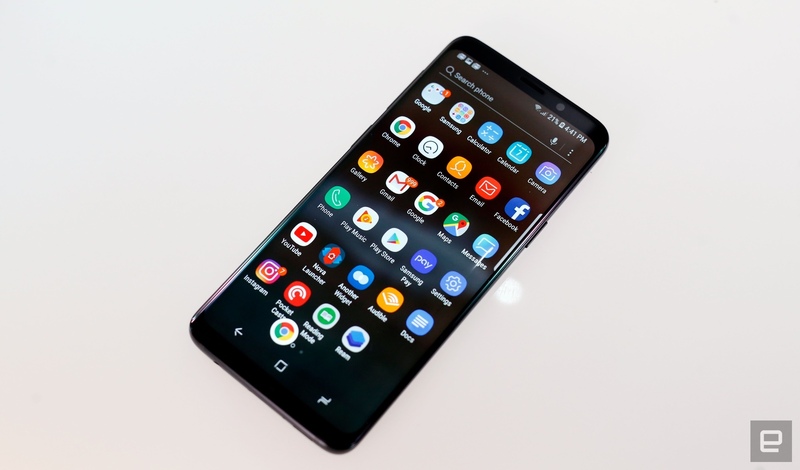 But with the Galaxy S9 and S9+, none of the new additions are must-haves. 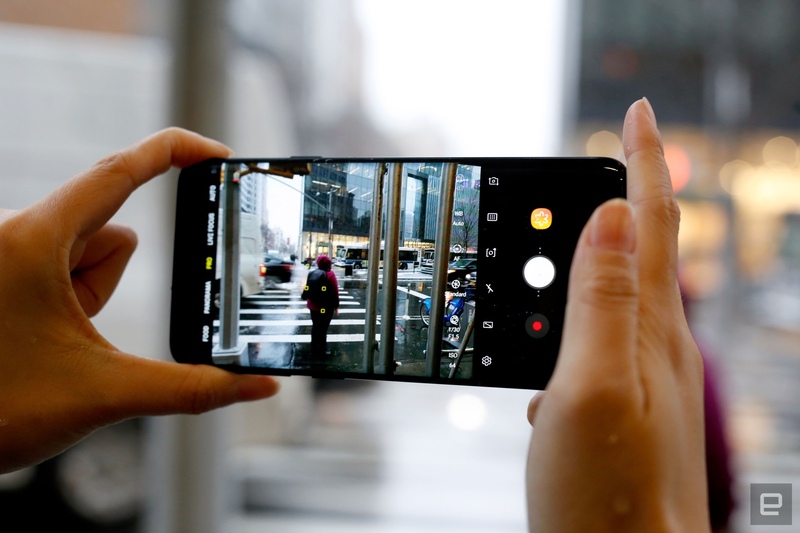 That's not to say these are underwhelming devices -- the Galaxy S flagships are still among the best Android phones around. How would you rate the Galaxy S9+? Despite not feeling like a major improvement over last year’s flagship, the Galaxy S9 is still one of the best phones around. How would you rate the Galaxy S9? The most interesting of Samsung's new camera features is Dual Aperture, which is available on both S9s (only in the wide-angle option on the Plus). This supposedly mimics the way the human eye works. When you're in a dark environment, the lens opens up to a wide aperture of f/1.5 to let in more light, just like our irises do. If the scene is bright enough, the camera defaults to f/2.4, which offers more clarity. In Pro mode, you can decide which to use, but you can't pick f-stops in between. For those who like shooting on auto and letting the phone do the thinking, this means you can get brighter shots at night or in dark rooms. You'll sometimes find details blown out at f/1.5, but in general, the larger aperture is good at letting you capture what otherwise might have been a dim, noisy mess. Focus can get a bit soft at f/1.5 compared to at f/2.4, but to the untrained eye, the difference is negligible. The new, wider aperture is now the largest available on a smartphone and gives those who prefer manual control more room to work with. You can then tweak things like ISO or shutter speed to avoid noise and motion-blur. Those who have the skill or patience to tweak those levels should consider shooting primarily in Pro mode. Samsung added dedicated RAM to the S9's image sensors to process multiframe noise-reduction more quickly. I easily fired shot after shot in the dark, and the S9+ never slowed down, unless I was testing its ability to keep up by hitting the button nonstop like a deranged shutterbug. The pictures also turned out relatively clear, although details like building edges are often muddy. You'll only really notice those artifacts when you zoom up close. Because of these small blemishes, though, pictures from the Pixel 2 and iPhone X generally appear crisper than the S9's. 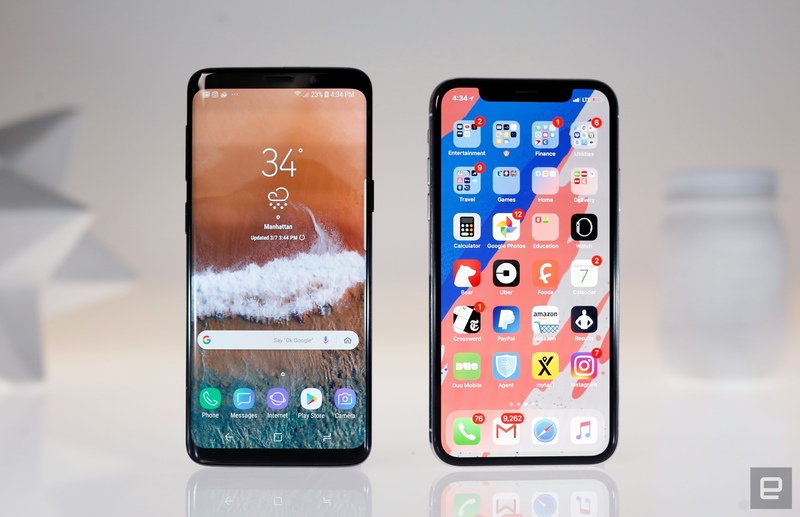 Galaxy S9 Plus (left) versus the Google Pixel 2 (right). Something that the S9s do that the Pixels and iPhone can't do yet is shoot super-slo-mo at 960 frames per second. For the most part, people don't need such a high framerate -- the 240 fps on the previous generation is perfectly adequate for scampering pets or skateboarding tricks. And as fun as the 960 fps clips are, trying to record them requires some finesse. You can use auto mode, which switches to slo-mo when it detects motion in a particular area of the frame. This means you'll have to aim your phone just right, which is fine for orchestrated setups like throwing peanut M&Ms into a friend's mouth or popping a firecracker. But for unpredictable subjects, it's less likely to work. I had the same complaint when Sony introduced this feature in the Xperia XZ Premium last year, but neither company has implemented a reliable way to record ultra-high-frame-rate video. Which begs the question: Is this feature really useful? Probably not, but still, it's there if you want to show it off. Just note that, as is usually the case with footage at such high shutter speeds, you'll need a ton of light to capture anything that looks remotely decent. Most of the clips I recorded indoors or in anything less than bright daylight looked kind of janky. On the whole, the additions to the S9s don't give the new flagships a significant edge over the competition or their predecessors. But the new tricks don't take away from the already-solid cameras that have won the S series much acclaim over the years, either. Even with Bixby, most of the changes revolve around the camera. Samsung's digital assistant is primarily getting improvements to Bixby Vision, including better integration into the camera. Just tap a button on the viewfinder to bring up Bixby, and you'll find a row of little icons at the bottom to switch modes. Three modes have been added: Live Translate, Food and Makeup. The first uses Google to translate foreign words in real time and came in handy when we were in Barcelona. The S9 helped me make sense of Spanish menus and warning labels, although it was useless without an internet connection. Of course, you also don't need Bixby to do this; you can just install Google Translate (and that works offline). Meanwhile, Food mode will identify the dishes you point your S9 at and provide a calorie estimate, which you can add to your S Health log with a tap. This is useful in theory, but most of the time Bixby failed to recognize the delicious meals I was about to dig into. It mistook fish filets for ravioli, thought a can of Estrella was a pack of Lays and couldn't even identify a bowl of instant ramen. The one time it worked, aside from during our hands-on, was when it identified a plate of cut-up steak as "flank steak." It's hard to tell what affects Bixby's accuracy here, except that more complex dishes with mixed ingredients tend to trip up the AI more. I know that, at this stage, I wouldn't trust the S9 to offer a reliable calorie count. Finally, there's Makeup mode which, admittedly, has limited appeal. But for those of us who are more cosmetics-obsessed, this has potential. It'll overlay lipsticks, blushes, eyeshadows and eyebrows on your face in real time, and you can click through to buy or learn more about a product you like. Sounds nifty, except it's just not comprehensive enough. Makeup aficionados like myself probably already use apps like YouCam Makeup or Meitu to see what colors we like, and those offer far more color and product options than Bixby does right now. Long story short, the Bixby updates are nice, because you can conveniently access them from the camera. But you can also install third-party apps to get the same results, or sometimes better. Another update that has to do with the camera is "Intelligent Scan," which is sort of a take on Apple's FaceID. 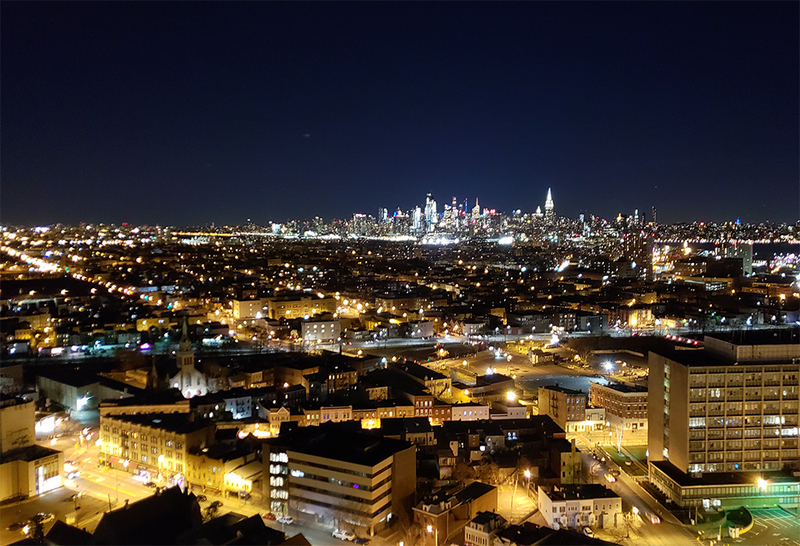 It's more of a refinement of the Note 8's iris scan method, though, which Samsung admitted works well in low-light but struggles when it's bright out. To make it easier to unlock your phone with your face regardless of your surroundings, Intelligent Scan will first try to identify your irises. If that fails, it will look for your face. You can also set Face Unlock, iris scanning or the fingerprint scanner as your primary unlock method if you prefer, or have them all enabled at the same time. In general, Intelligent Scan worked very quickly, and I usually got into my S9 with little trouble. But because I set up my biometrics with makeup on, I sometimes had trouble getting into the phone first thing in the morning. A more polarizing feature debuting in the S9s is AR Emoji -- or augmented-reality emoji. You've probably seen these online by now: animated talking heads that vaguely resemble people you know. Some find them creepy; others, fun. So far, I'm leaning toward the latter. It's easy to create an avatar. Just snap a photo of yourself facing forward, and the phone generates a digital version of you that can be tweaked and customized with various hairstyles and outfits. But after testing it on a bunch of my colleagues, it's clear Samsung's software isn't perfect. Some people look uncannily like their avatars, while others look like cartoon stock photos. With some styling, though, you can usually get pretty close. After you're satisfied, save the emoji, and the S9 generates a set of animated reaction GIFs featuring your avatar, which you can insert in any chat app that supports AGIF (including Messages, Messenger and WhatsApp). These are cute at first and feel more personal than regular emoji. But over time, I got used to seeing the same few expressions, and the novelty wore off. To mix things up, you can send a video of yourself talking through your emoji -- much like Apple's Animoji. Instead of mapping your expressions onto a generic graphic like a robot or a turd, Samsung lets your avatar do the talking. This would be a fun feature, except the S9 struggles to pick up facial movements. When I smiled into the front camera, my emoji cringed. When I tried to wink, my emoji suddenly developed an odd lazy eye and squinted like a belligerent drunk. This is the crux of why AR Emoji seem creepy. Your expressions tend to be more hilarious and wonky than accurate, and generally fail at conveying the emotion you're intending. Obviously, AR Emoji are a novelty, and frankly, it's hard to imagine they'd be anything but. In my week with the phone, I barely sent any, other than to show off how ridiculous they are. In addition to camera-related upgrades, Samsung introduced a new audio setup this year. The S9 has stereo speakers -- one firing down from the bottom edge and one forward from the screen. This boosts the S9's volume, making it easier to hear what people are saying in your videos and games. It definitely helped when trying to share funny YouTube videos in a crowded restaurant. For those of you who like watching trailers and movies on your phone, you may also appreciate improved audio quality thanks to the Dolby Atmos-enhanced virtual surround sound. But honestly, I didn't find it radically different except for the boost in volume. Samsung also tidied up the phone's face, masking the array of sensors above the screen and trimming the bezels. These changes are subtle, and you wouldn't notice them without putting an S9 directly next to an S8. More immediately noticeable is the new location for the fingerprint sensor, which now sits comfortably within reach below the camera, instead of right up next to it. Hallelujah! Something else you won't catch until you're actually using the phone is the new Snapdragon 845 processor. Just on benchmarks alone, the S9s generally performed almost twice as well as the Pixel 2, although, to be fair, Google's phones are using last year's CPU. Like previous Galaxy S flagships, the S9 Plus handles multitasking well. I had no problem jumping between the Bixby Vision, Instagram and Gallery apps, or creating AR Emoji after AR Emoji. Multitasking with split-screen windows was also smooth, and I breezed through several satisfying rounds of Tekken. The only lags I encountered had more to do with waiting for Bixby to finish thinking than general performance. The Snapdragon 845 is also supposed to squeeze about 30 percent more life out of the battery than last year's 835. Anecdotally, this seems about right. The S9s have the same size batteries as the S8s, but generally last at least a day-and-a-half before throwing up a low-battery alert. In the 10 days or so that I've had the S9+, I still haven't had time to run a formal battery test, but we'll be sure to update this review with the numbers once it's complete. It doesn't feel fair to compare the S9 and S9+ to the usual suspects. After all, the Pixel 2, iPhone 8 and LG V30 are last year's phones, using slightly older (and slower) processors. As some of the first phones to pack the Snapdragon 845, the S9s have a clear speed and power efficiency advantage. The only other phone that sports that chipset is Sony's Xperia XZ2, which can record 4K HDR video. That's a feature Qualcomm touted highly, but strangely enough, the Galaxy S9s don't appear to offer. It's a significantly different phone from the S9, though, with a greater focus on multimedia consumption than photography. We also haven't fully tested it. For now, if you're deciding between the two, it's best to hold off until we can properly review the Xperia. Another phone to consider is the LG V30S ThinQ, which is a strange follow-up to last year's V30. It adds AI camera features that help you take better photos by identifying what you're trying to shoot and automatically changing the relevant settings. It also adds a "bright mode" that uses an algorithm and merges pixels to brighten a scene. It's hard to tell how effective this is yet -- our hands-on showed no significant benefits from having that mode on. What's strange about the V30S is that, barring a RAM boost, its hardware is no different from the original V30. You don't even get a new CPU and the accompanying performance improvements. I had hoped that, after exhaustively going over all the ways the S9 is new, I'd find the updates here to be more significant. But I still don't. 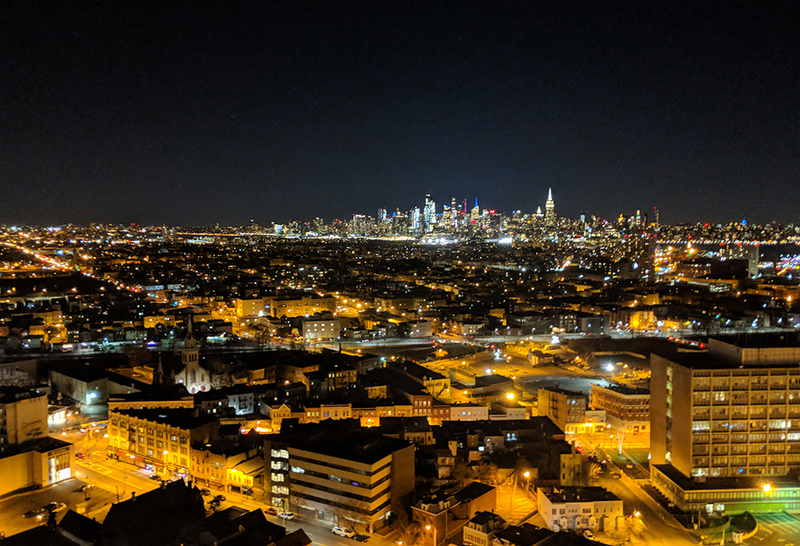 The new camera features aren't must-haves unless you plan on shooting in darkness a lot, and you can get basically all the new Bixby stuff by installing third-party apps. Plus, Samsung plans to roll out the Bixby updates to S8 and Note 8 owners eventually. But even though these changes feel incremental, the S9s are still strong flagships. If you're looking to upgrade from an older Android phone, these are worth considering thanks to speedy performance, capable cameras and long-lasting batteries. 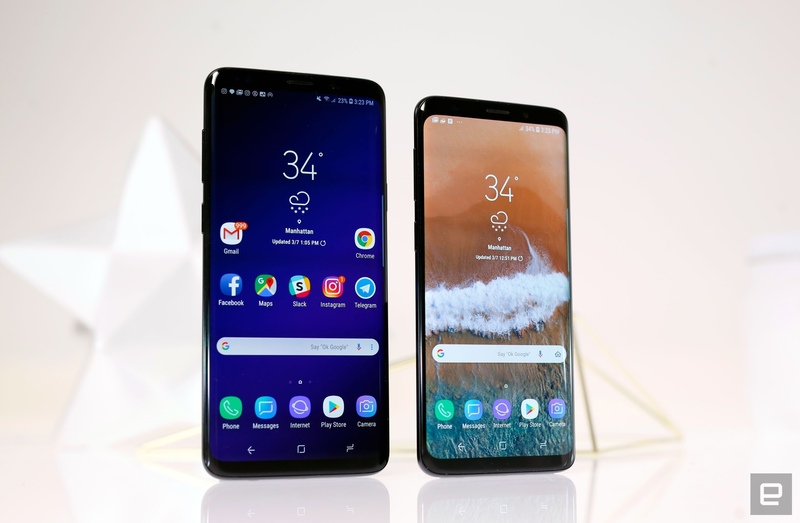 As the first flagships launched in 2018, the S9s are competent, if unexciting. It'll be more interesting to see how they measure up to flagships from Apple and Google later this year.